Apologies if this has already been posted, but I saw it and thought people on here would want to read it. My heart sank a bit when I read it, but hopefully it means the hall will finally get sorted and its getting the attention it deserves. One time I was walking round Leeds with a lady from Brazil who was visiting (a couple of years ago) and she thought that that part of Kirkgate was one of the most beautiful places she'd ever seen and the buildings were stunning. You can imagine how much she loved parts of the city that had already had money spent on them! I've been a long time reader, but this is my first post and hopefully the first of many! This is such a wonderful forum! How come The Grauniad picks this up and not the YP/YEP? I suppose the answer to that is obvious really! Hi Greeno,welcome aboard.All new contribitors and their contributions are welcome. The part demolition was mooted a while back,and it was (for once) in the YEP. I presume that the Leeds Guardian is being edited or run by Martin Wainwright. I think cold reality should set in here really. The notion of restoring the Cloth hall is a great one. But for what little of it remains. There will be even less of it remains when they start demolishing the later additions. In my opinion the whole thing is structurally unsound, It will all have to come down, It's beyond salvation. By the sound of things it may well soon fall down of its own accord. I wonder what may be found in the debris if it is demolished or falls down? And we know who to blame for its condition.Like many other buildings lost in Leeds value of the land comes before history of the building. It doesn't look promising does it? The YEP report on the matter. This of course is what we see over and over again when procrastination exceeds action with these buildings, isn't it? 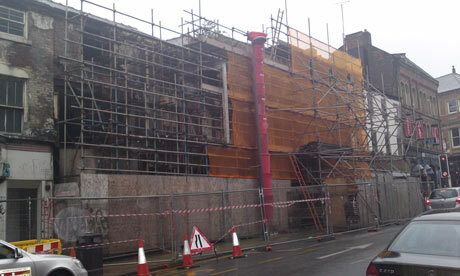 The restoration of one of the oldest buildings in Leeds is under threat. Last month the YEP reported that developers want to bring the first White Cloth Hall back to life. Only 15 per cent of the original structure, which dates back to the early 18th century, exists hidden behind crumbling shops at 98, 99 and 100 Kirkgate. Scaffolding and netting have been put up to protect the public from falling masonry and metal fencing has closed off the footpath. But surveyors have discovered the next door building – number 101 – has serious structural damage including a crumbling lintel. It must be demolished and work is due to start on Wednesday. This causes a problem as the adjoining buildings are Grade II* listed. Unsafe sections will have to be removed, brick-by-brick, labelled and then re-built. For Gordon Noble, owner of Hills Furnishing Stores Limited at 103 Kirkgate, the work cannot start soon enough. He said: "It's very unstable, that's why they've put up all this scaffolding because they're worried about something falling off and hitting somebody. "We don't really know what will happen to our shop, which we rent, until the demolition has begun. It's a sad state of affairs in this street at the moment." The block is owned by property firm City Fusion and Harewood-based investment company Vektor Investments who will pay for the demolition work. Mr Noble added: "We have been told over and over again that it would be mended and the scaffolding moved, but nothing happened. "It's absolutely killing our business because no-one can walk past our shop window." A Leeds City Council spokesman said: "The first White Cloth Hall is one of the most important historic buildings in the city, but a recent inspection showed the building next to it is on the verge of falling down. "Because it helps support the hall there is a significant risk that both could collapse, posing an urgent risk to public safety. "Parts of both buildings will be demolished. Where possible, an archaeologist will be on hand to record anything the demolition will reveal, and all the materials salvaged, carefully labelled and stored so they can rebuild the hall. "We are also working with the building's owners to bring forward the redevelopment that includes the hall's restoration."